As anyone who has tried it knows, one of the greatest challenges in art is drawing people. People, it turns out, are experts at knowing what people should actually look like. It might be OK to wing it on that landscape or still life, but get the nose a little off, put the eyes in slightly the wrong place, or just bobble the chin by a millimeter, and your portrait masterpiece quickly becomes laughable. 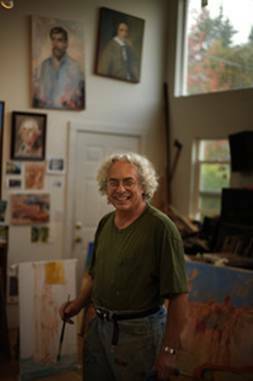 Consider, then, Jerry Ross, a Eugene artist who has developed a following in town for his fine oil-on-canvas portraits. Painting one figure is no longer enough to satisfy the 63-year-old artist. Lately he,s been trying to work whole crowds into a single painting. "Multi-figure painting: It,s probably the ultimate challenge," Ross says. "It is one thing to do a portrait, or even one figure standing somewhere. When you have to have more than one figure in relationship to one another it becomes quite a challenge technically and in terms of draftsmanship, if nothing else." Putting more than one person into a single painting is, in fact, far more difficult than the sum of all those individual paintings. "They have to be convincing not just as individuals," Ross says, "but as a group. Its a gestalt, and the gestalt has to work. You cant just have a convincing figure alone. They have to work together. It,s like choreography." You can see Ross, new work with multi-figure painting in a show that opens Tuesday at the Springfield Museum. Titled "La Spiaggia"  "The Beach"  the show is built around a series of quickly executed oil sketches Ross has, in recent months, been painting of beach scenes in Italy. The paintings are quick, light and loose, almost Impressionistic in their handling of light and detail. Hes painting them fast, trying for an economy of expression that reduces the complex images of people and umbrellas to a few deft brush strokes. Ross has been interested in multi-figure painting for years. In addition to his portraits and landscapes, he,s worked steadily on a series of canvases that are based on Old Master history paintings of battle scenes or mythological figures. In those paintings, the blocked-in compositions are borrowed  "quoted, might be the correct postmodern term  from classical European painting masters. They have served as an apprenticeship for multi-figure work, but, until now, Ross hasn,t been satisfied with his own multi-figure works. ,I have attempted this in the past and have been less successful with my own compositions," he says. "I was very successful at copying other artists like Rafael and Veronese. When I went off on my own with original material, I was not being very successful." Maybe all that Mediterranean sun and sand made Ross loosen up a bit. Maybe all that work researching past masters  and all the hours he worked in the studio, around his day job as a computer science teacher at Lane Community College  have finally paid off. In any case, he calls the beach paintings an artistic breakthrough. "I try, once in a while, real hard to have a breakthrough," he says. "Just being able to paint spontaneously, and, without a lot of effort, get these multi-figure compositions to work  and do it with several brush strokes and to be able to build on that and make a bigger composition." A strong influence on Ross work has been his discovery, some years ago, of a 19th century Italian art movement little known outside the world of art history. The I Macchiaioli, as the group came to be called, were already revolting against European academic conventions in art a decade before the Impressionists cut loose in Paris. Like the French radicals who would follow, the Macchiaioli made paintings that were loose, fast and lively, painted on the spot instead of in a studio. But while the Impressionists painted soft landscapes, flowers and dancers, the Macchiaioli, many of whom were disillusioned military veterans, painted military and even battle scenes in addition to landscapes and genre paintings. That gives them common ground with one of the few groups of artists actively doing multi-figure paintings in America today: the Western artists who do cowboy and Indian and Civil War history paintings. Which brings Ross to a favorite complaint. Like the Macchiaioli more than a century ago, and like the cowboy and Indian artists of today, Ross feels sidelined by what he calls a rigid 21st century academy of art: university art departments. "Academic art departments are almost 100 percent conceptual," Ross says. "They do installations, art that is based on an abstract concept, and usually implemented through multimedia, as opposed to paint and brushes and canvas." Ross kind of likes that underdog stance. He also identifies with the leftist politics of the Macchiaioli. In 1968  then named Gerald Gross  Ross was one of nine people arrested by federal marshals in an anti-draft protest in his home town of Buffalo, N.Y.; the case became celebrated as the Buffalo Nine. Ross was charged with assault on a federal marshal. After two hung-jury trials, his charges were dropped. Four of the nine were convicted and two did time in federal prison. These days his activism is mainly artistic. Ross founded the popular Salon des Refuss, which shows works rejected by the Eugene Mayors Art Show, and was an early backer of DIVA, the community art center downtown. Even underdogs sometimes have their day. While none of the Macchiaioli ever met with much critical or financial success in their lifetimes  even the name Macchiaioli was a derisive term, much as Impressionist would be  they are now considered the most important artistic movement in 19th century Italy.